As if the craziness of unpacking wasn’t enough, leave it to us to add several black trash bags and a tarp-load of just-harvested chard to the mix. 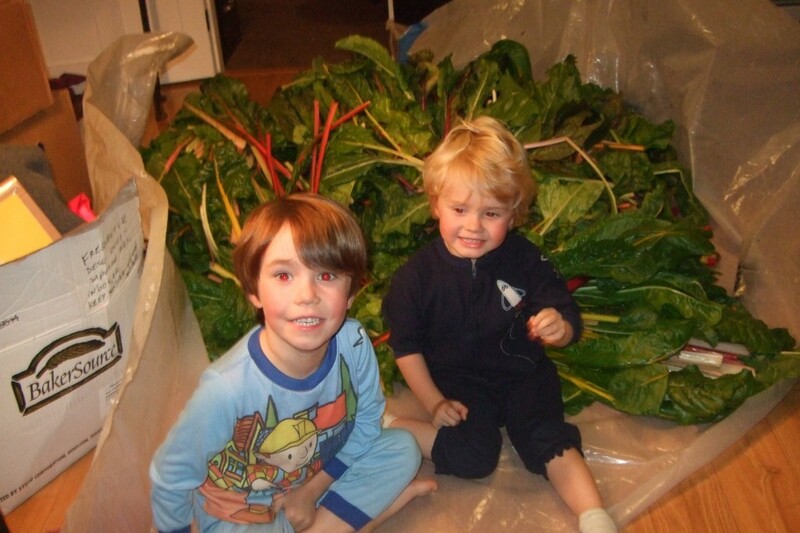 Yes, that’s the chard, in our chaotic, half-unpacked dining room (along with two over-tired boys). For the record, trash bags and tarps are not my harvest tools of choice….but hey, when everything is in still packed in boxes, you can’t find anything, and the threat of a hard frost is looming, you make do, right? (and also for the record, I’m still catching up with my posts….this was back in October, but thought I’d share anyway…). In any case, Ben harvested the last of the chard from our community garden plot one evening after work, drove it home, and we spent the weekend putting it up. We’d heard frost, but we actually ended up having unusually warm weather. Ben’s sister Heather was visiting from Philadelphia, and it was so great to have her company, as well as her tremendous help. What’s more, I got to use my new outdoor propane burner for the blanching! 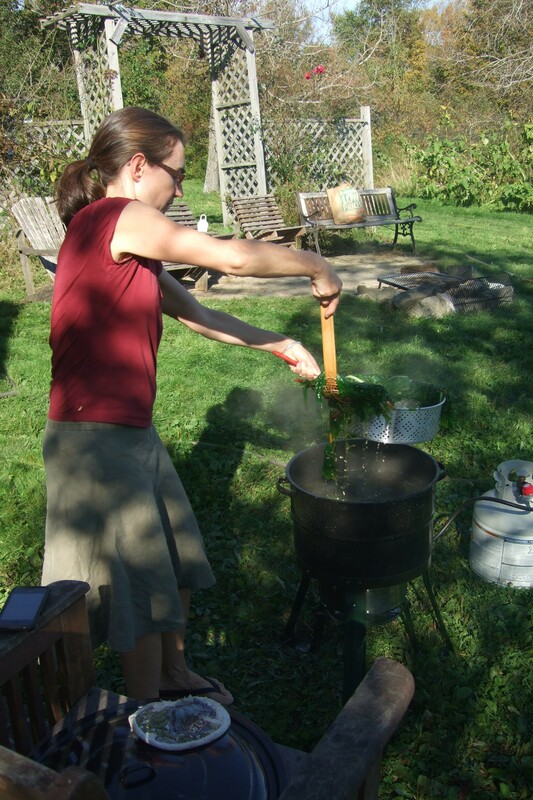 This has been a long time coming, and so exciting for me–I have for so long wanted to be able to do my preserving work outside, and finally I now have both the outdoor space and the equipment to do so. I have to say that I can’t imagine many more enjoyable ways to spend the day than putting up for the winter goodness from our own garden, enjoying the gorgeous weather, and our whole family working and playing outside together. Joy! 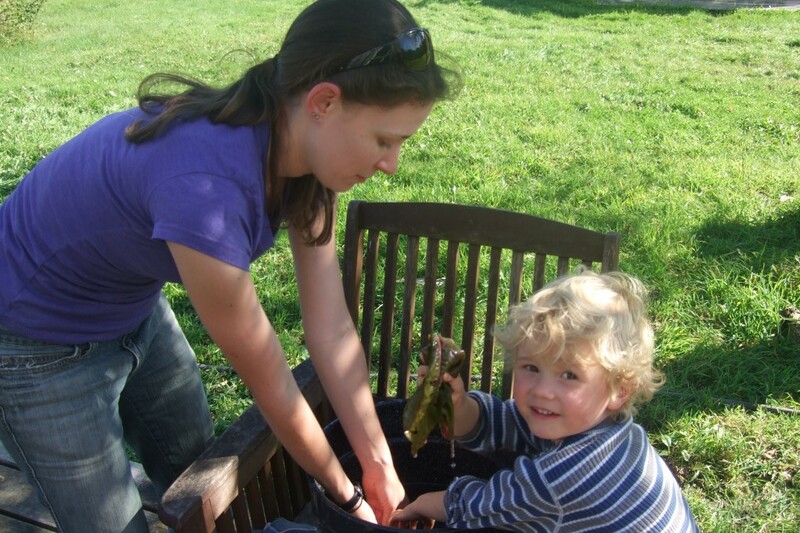 Ben sorting the chard…..Connor and Ian enjoyed playing with their cousins Miles and Rosie who were over for a visit. 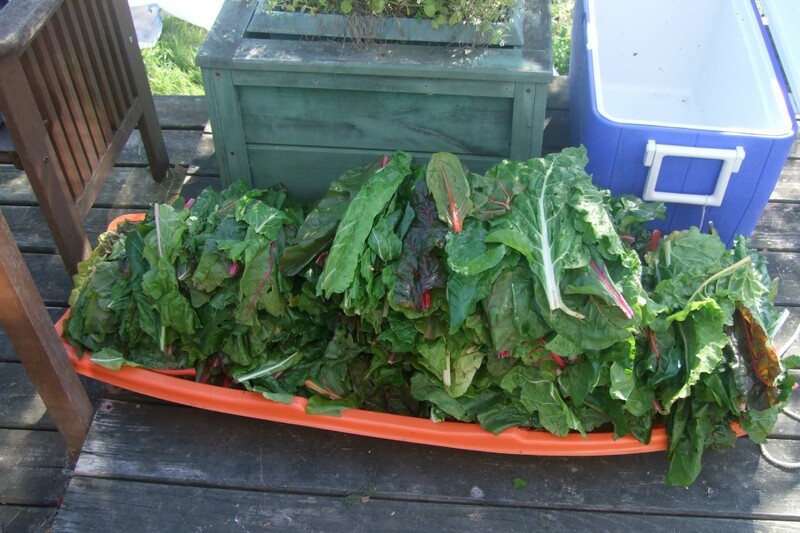 The chard sled. 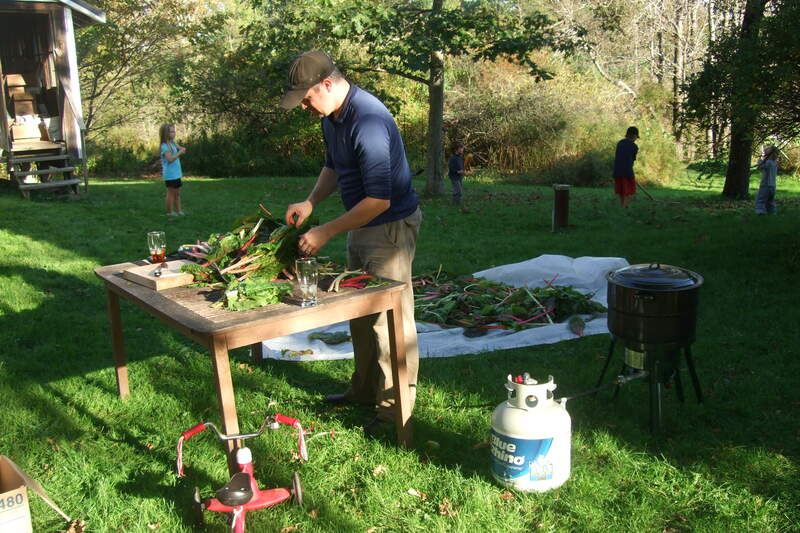 After we took the stems off, the chard went for a little ride in the sled over to the washing station. Heather and Ian washed the chard in our largest canning pot…. 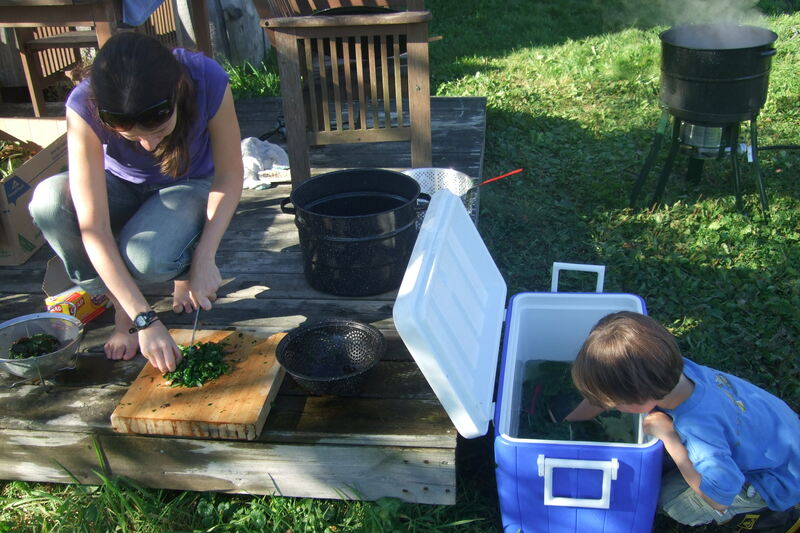 …..and we also did a lot of washing in a large blue cooler. 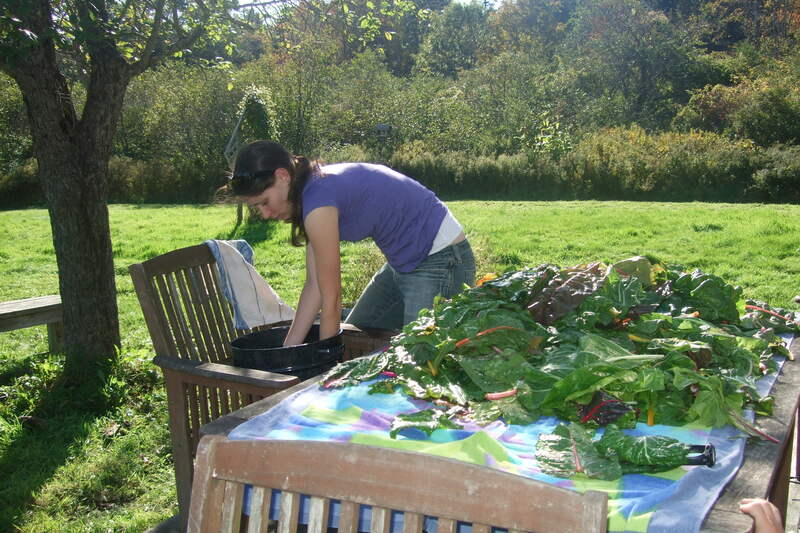 After washing, the clean chard took over the table, awaiting blanching…. Blanching the chard on my new burner! Connor cooled the blanched chard in an ice water in the cooler while Heather chopped the cooled chard and put it in bags for freezing. 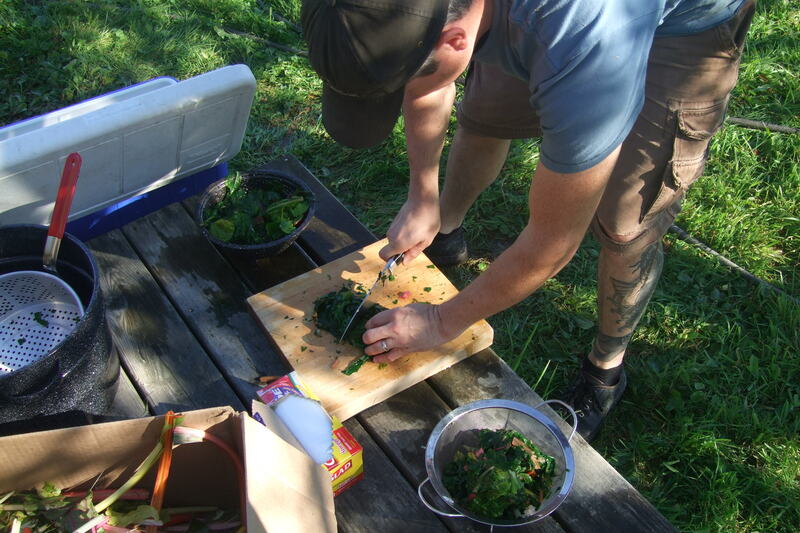 Ben chopping chard as well…..lots to do! End of a long and rewarding day…..thanks for all the help, Heather! I'm Allison Carroll Duffy. 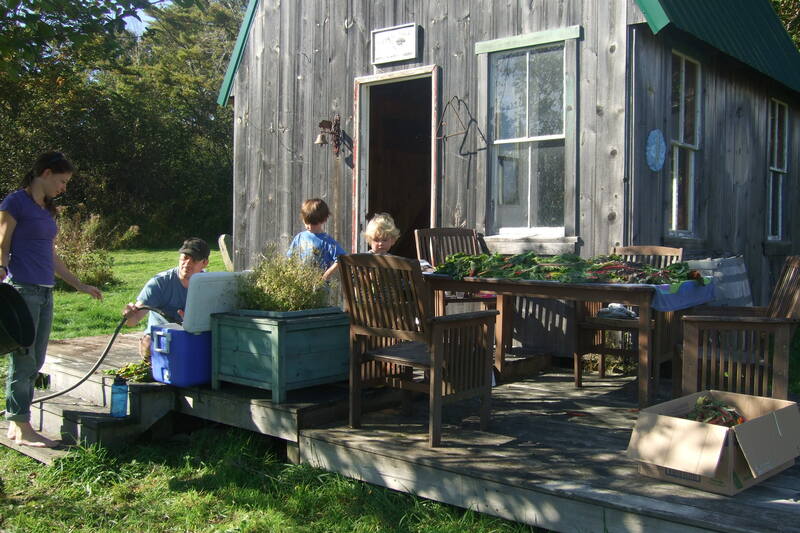 I'm a food preserver, vegetable gardener, cook and foodcrafter (as I call it), and mom of two young boys. 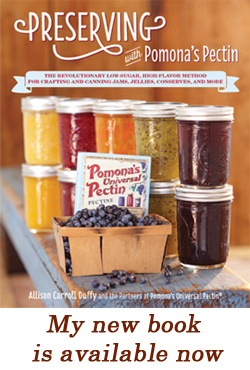 I teach classes and write about canning and preserving--my book "Preserving with Pomona's Pectin" (Fairwinds Press, 2013) Is available now. 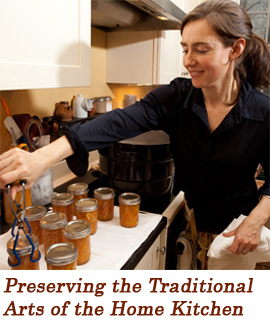 My goal is to inspire people to do more canning and preserving, foodcrafting, and home cooking, and to bring more of the traditional arts of the kitchen back into our homes and everyday lives. I hope you'll join me....and, thanks for stopping by! © Copyright CanningCraft. All rights reserved.